O glorious Saint Francis, who during the whole course of thy life continually wept over the passion of the Redeemer, and labored most zealously for the salvation of souls: Obtain for us, we pray, the grace of weeping continually over those sins by which we have crucified afresh Our Lord Jesus Christ, that we may attain to be of the number of those who shall eternally bless His supreme mercy. 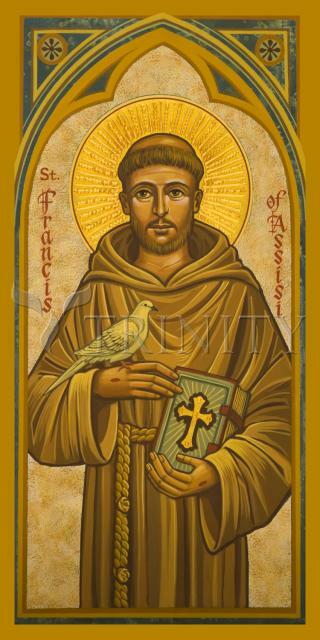 St. Francis of Assisi (1181-1226) is a universally loved historical figure; he is even revered by many non-Catholics as a holy and inspirational man. Although he is widely admired as the patron saint of animals and the environment, how many of us actually seek him out in prayer to help us grow closer to Christ? St. Francis of Assisi was one of the greatest saints in Church history. He the first-known saint to receive the stigmata, the very wounds of Christ. This means that he was so unified with the sufferings of Jesus that his body bore physical witness to the fact. Needless to say, he was an excessively intense saint who lived the Gospel to a radical degree. The real St. Francis is much different from the soft, mellow, forest-dwelling friar that he is often portrayed as today.